Our Analytics month continues with this week’s Say by Project Supporters and Users telling us the experiences they have had with the programmes and projects we selected to conduct monitoring, evaluation and review. We are asking Project Supporters, Users and other stakeholders to provide their views using their own words. This Say is about how they perceived and interacted with the products and services we presented to them over the last 345 days. The selected programmes and projects for the purpose of monitoring, evaluation and review are listed in the main development section of this communication. This week is also the start of a new engagement with Africa-based Organisations; engagement aiming at tracking wealth (i.e. infrastructure, forests, minerals and human capital) with the possibility of using them to reduce poverty. We will be trying to work with them to explore the extent to which they can use Wealth Accounts as Tools for Poverty Relief and Sustainable Development. For more on wealth accounts as tools for relief and sustainable development, contact CENFACS. Our preparation for this Summer Festival (Seven Days of Development in July Festival) is still in progress. They will be seven themes for thoughts for seven days as usual, one theme per day, starting from the 22nd to the 28th of July 2018. These are the days of thoughts and actions against poverty. 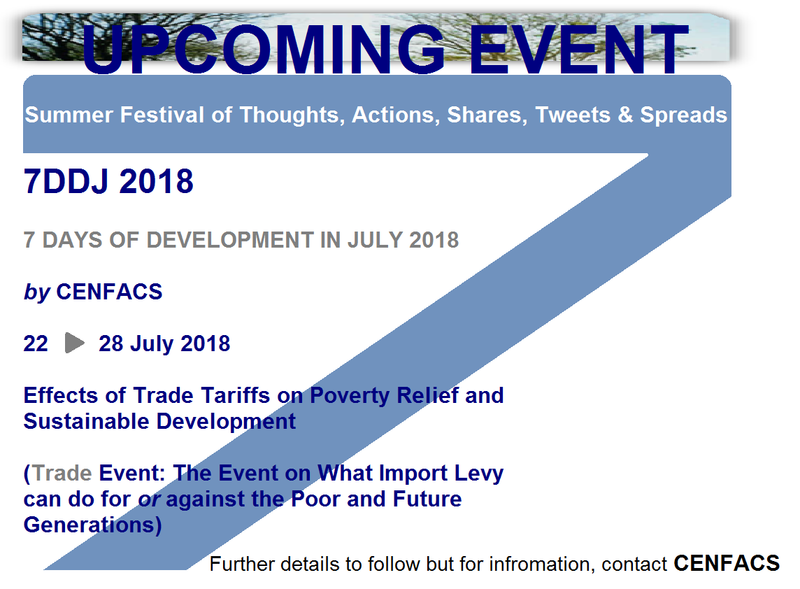 We shall soon publish the daily themes and supporting information regarding this Festival of Thoughts and Actions on the Effects of Trade Tariffs on Poverty Relief and Sustainable Development. Tell it in your own words! This exercise is meant to enable Supporters and Users (you might be one of them) to share with us and others the outcomes and learning experiences resulting from the use/application of the projects we have chosen from our Programmes for feedback purpose. Please seize this opportunity to provide your own lines of thought for improvement, adjustment and development by sharing with us and others the outcomes and/or experiences resulting from the communications we have had with you and or your use/application or participation/support concerning the programmes and projects below. We would like to know how effective and efficient did you find in these programmes and projects, and what lessons, experiences did you learn and development for the future of our poverty relief work in coming years. We would very much appreciate if you could provide us a feedback (via e-mail, text, phone, web comments or reviews etc.) in your own words regarding the way in which the named programmes and projects below have affected you and/or the people you recommended to use them. Remember, we can only help reduce poverty and do the changes we all want if you tell us what you think. Please consider our request for feedback and for your report. Thank you for considering our request of feedback and for your support. Details and summaries of the above selected programmes and projects are available from CENFACS for request. This feedback is due by the end of July 2018.